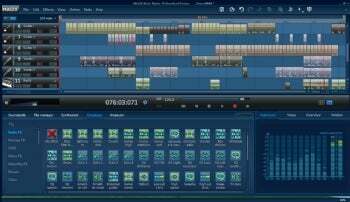 I was impressed with Magix's Music Maker 16 ($60) digital audio workstation. It's a relatively simple program compared to, say, Digidesign's Pro Tools or PreSonus's Studio One, and lacks true audio editing, but it's far more powerful a DAW than I expected for $50--supporting both pro-level ASIO audio drivers and VST virtual instruments. Music Maker's interface is nicely rendered and easy to use. Music Maker is nothing if not easy to use. Tracks for recording audio, MIDI, or placing video objects stretch across the top of the main window. Various palettes reside below it, including the soundpool (pre-recorded loops that you may combine to produce music right away). There's also a rack for synths, an FX pool, and a nice onscreen keyboard for entering notes. Robota, a drum sequencer/module, is included in the download demo. Just about everything in Music Maker is drag and drop. You drag audio loops and midi patterns onto tracks, drag FX onto audio objects to implement them, etc. You can even drop video object into the track layout and preview it in the lower right-hand corner of the program. More serious musicians, including those that can actually play an instrument will be happy that Music Maker also allows you to record audio and MIDI, and the MIDI step/drum/list editor is first rate. Alas, they won't be too happy with the lack of a wave editor: There is no way to edit audio clips other than apply FX or changing their length in the track window. The $100 Premium version of Music Maker includes an external wave editor, but this basic version does not. Playback was quite tight, and the overall sound emanating from my EMU 0404 soundcard was excellent. If you're just starting out, you could do a lot worse than Magix Music Maker. You'd face a far steeper learning curve with the aforementioned programs or a product such as Cakewalk's Sonar or Steinberg's Cubase. However, the lack of real audio editing is deal-killer for more hands-on types.